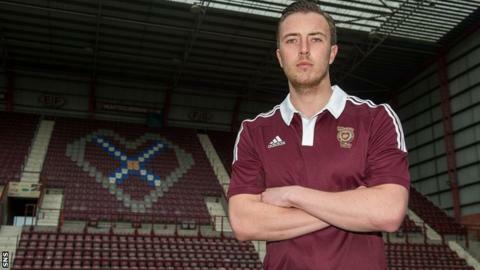 Captain Danny Wilson is not thinking about playing his football anywhere other than with Hearts in the Championship next season. The former Liverpool and Rangers defender has still got another year on his contract and insists his focus is fully on Hearts. "I'm not really in any hurry to make any decisions," he told BBC Scotland. "There's a lot of other things that are going in the club just now and it's important they get sorted out." Hearts are in the process of coming out of administration and are due to start next season in Scotland's second tier. A 15-point deduction was imposed at the start of the season owing to the club's insolvency problems and relegation was confirmed earlier this month. Ironically, results in recent weeks have taken an upturn, with Gary Locke's side unbeaten in four matches. "It's been tough, there's been tough moments this season," Wilson explained. "There's also been some highs, but there's been some really low lows. "The last few weeks, the club's had a bit of a pick-me-up. Results on the field have been good and, even more importantly, off the field have been good. "There's a little corner being turned and we're all looking forward to the future now. "We knew what the situation was at the start of the season and we've all tried to get on with it as best we can. "At times, it's not been quite good enough this season. We're not in the position we had hoped to be in. "You can see now that the performances are starting to come, albeit it's probably just a little bit too late." Wilson insists Hearts will take their "medicine" and adapt to what he expects to be a "tough league", with Scottish League One winners Rangers also bound for the Championship. "We'll go down and we'll be ready for next season," he said. Before then, however, Hearts have four fixtures to fulfil, starting with Sunday's Edinburgh derby against Hibernian at Easter Road. Hibs have been struggling of late and may yet finish in the dreaded relegation play-off spot. "Nothing changes from our perspective," added Wilson. "We're going to go down there fully committed to get the three points."